The Okanagan Valley is not really known for it's great fishing. It has become famous for it's wineries and the hot arid climate grapes thrive in. Long deep lakes filled with boats in the summer and people water-skiing and paragliding compete for real-estate with pine-covered mountains and sprawling grasslands that dominate the low hills. The Okanagan isn't known for it's great fishing, but that doesn't mean there isn't any, in fact, there's all kinds of it! It doesn't matter if you flyfish, toss gear or prefer to troll away the days on a big lake, the Okanagan has something for everybody and as a rule, it's not hard to get to in the family car. Many species of fish swim in the Okanagan waters and while the lakes aren't quite as fertile as their cousins in the Kamloops and Merrit area, the fish here enjoy a long growing season and some of the fish get very large. Rainbow, brook and lake trout are common here, as are kokanee, carp, whitefish, perch, burbot and bass. In some cases you will be sharing the water with water-sports enthusiasts but there is plenty of space to go around so conflicts are rare. The Okanagan is hot and sunny most of the time but the winter is something to be reckoned with some years but in others, the cold and snow sometimes fails to show up at all. Generally speaking the high-elevation lakes are ready to ice-fish by late-December and the low-lying lakes, if they freeze at all can be fished by mid-January. It is important to note however that the consistency of the ice on the low lying lakes can be notoriously unreliable. Don't fish a lake unless you are sure of the ice thickness and watch where the locals are fishing to avoid springs and other dangerous conditions. As a rule the higher lakes are pretty safe as long as you wait for the ice to get thick enough to fish. Wood Lake in the years where the ice is safe is a very good winter fishery for large kokanee but be very aware of the conditions, somebody goes through the ice nearly every year. When it's thick enough there will be no shortage of company on the lake. Other hard-water in the winter to drill a hole through with good winter access would be Yellow, Pinaus and Swan. One thing you aren't going to do a lot of in the Okanagan is river and creek fishing. That doesn't mean there isn't any but the Okanagan Valley is definitely better known for it's lake fishing. Here are just a few to get you started. Starting in the South near the US border, Osoyoos Lake has a wide variety of spiny ray species, large and smallmouth Bass, crappie, perch, sunfish as well as trout, kokanee, carp and an emerging sockeye fishery in the late Summer. Fish from a boat in the early mornings and the evenings when it's not too hot or windy. The Rainbow trout can reach 10 pounds but four pounds would be a more likely catch. Just north of Osoyoos lies the small town of Oliver. This is the perfect place to pick up some fresh fruit from the abundant orchards of the area on your way up into the hills just west of town for a try at Sawmill Lake. Sawmill is managed as a trophy fishery with special regulations so be sure you check them before you leave. Fish here reach very healthy sizes but are in no way easy to catch so practice your fly-casting and try to sneak a peak at what the locals are using. A 4x4 is a good idea for this trip. Vasaux Lake, just up the highway from Oliver is possibly one of the most species-diverse lakes in BC. The water literally teems with huge bass, carp, trout, perch, kokanee, crappie, carp, whitefish, Northern pike minnow, chub and bullhead. You are not allowed any kind of motor in the lake and be careful not to be on the far-side of the lake when the inevitable high winds kick up in the afternoon. Flyfish, troll or toss gear for these abundant fish. If you do get out of the boat on the west side of the late, be careful of your footing as rattlesnakes are common. To get to Yellow Lake, take the turnoff at hwy 3A towards Keremeos. rainbow and brook trout fishing can be very good on the shoals along the edges and at the west end of the lake. Yellow Lake is popular with ice fishing in the winter as well. Flyfishing works best on this lake. Skaha Lake is a large lake that stretches from Okanagan Falls to the city of Penticton. Skaha has good populations of rainbow trout, kokanee, carp and burbot but what Skaha is best known for, (other than water-sports) is smallmouth bass. There are some that say the next world record smallmouth will be caught in Skaha, I'd say that is a real possibility. Flyfishing works very well as do jigs, poppers, spinnerbaits and small crankbaits. Skaha can be very dangerous in a high wind so stick close to shore if you are in a small boat. Okanagan Lake is 135km long and averages four kilometers in width. The lake is best trolled, especially in the winter months with large plugs or bucktails for Rainbow Trout that can hit 20 pounds. Kokanee are making a comeback after a disastrous attempt to improve the fishery by introducing mysis shrimp. Lake whitefish grow to impressive sizes here as do the burbot that haunt the depths. Fish the creek mouths in the spring with light gear. Shannon Lake in West Kelowna is a great little lake, little more than a pond really, that holds rainbow trout, perch and surprisingly good sized largemouth bass. This lake is kid friendly and is a great place to kill an afternoon while your family shops in Kelowna or plays in the big lake. If you don't mind a little walking, Rose Valley Reservoir is nestled in a really pretty valley just out of sight from the city of Kelowna. Bring a float tube as shore fishing is difficult and cast flies for medium sized Rainbow in a quiet wilderness setting literally minutes from the core of one of BC's larger cities. At the top of the hills overlooking the city of Kelowna to the north east is the Aberdeen Plateau The plateau is littered with small lakes and a few larger ones. A full service lodge can be found on Beaver and Dee lakes and while most lakes are easily accessible by any vehicle with reasonable clearance, a few of them are walk-ins and sometimes offer spectacular fishing. Don't miss the areas fantastic traveling sedge hatches in the late spring/ early summer. Access these lakes by taking Beaver Lake road from Winfield. Continuing north towards Vernon, a stop at Oyama Lake is worth the short trip up the mountain. The road can be a little rough but anybody in a truck or an adventurous person in a car should have no trouble reaching the lodge at the lake. Oyama was famed at one time for it's large numbers of decent fish and while that has dropped off in recent years, by all accounts the lake is making a strong comeback. Many islands, sunken islands and inlets make fishing and boating very interesting in this family friendly lake. Between Oyama and Vernon is a beautiful jade-green Jewell known as Kal Lake. Kal is large and deep and owes it's unique colour to glacial silt that isn't scheduled to fully settle for another thousand years. Rainbow trout and Kokanee swim here but most anglers come to fish for the large Lake trout that are to be found in good numbers. There is no better place in the Okanagan to leave your family on the beach for the day while you get in a little fishing. Bring your big boat, Kal Lake is a large piece of water. Once you get to Vernon there is no need to travel great distances to get into some good fishing. Swan lake, just north of the town is shallow and bowl shaped on the bottom and much much larger than you initially think it is. The lake is heavily stocked and once you locate the trout which tend to be quite mobile, you have a chance at some really decent sized fish. A good boat launch just past the weigh-scale on the lakes east side is the only access to this urban fishery. Swan Lake is the only place I know to have a regular bumble bee hatch when the winds pick up and knock the clumsy fliers into the water from a neighboring apiary. Also close to Vernon is Becker lake, a very pretty brook trout lake on the mountain overlooking the East side of the city. Access is by gravel road from Noble Canyon. One caveat however to the lovely green shoals and fat willing brookies is that the lake is right in the middle of a dirt-bike trail system but if you don't mind the noise, Becker is worth a trip. Bring the quads for the kids and let them ride the trails while you catch a few trout. The Shuswap River where it winds past Enderby can be very good fishing at certain times of the year and very slow at others. It's as scenic as rivers get on the top half where it leaves Mabel Lake and the bottom half is a delightful slow float on a raft or tube. Be careful though, the river does claim the occasional unwary soul who gets caught in a sweeper or a log jam. Stick to the slower water towards town to avoid this. Spring salmon make their way up to Mabel Lake in the late summer and are popular with bait-fishermen and at certain times, a deeply sunken egg fly or nymph can catch some very large trout that have come down from the lake to feed off the seasonal buffet the salmon provide. Mabel Lake, north of the city of Lumby or east from Enderby is a very large lake with very large fish. In addition to the salmon in the summer months, large trout cruise these waters and many are caught, mostly by trolling. In the springtime fishing the creek mouths with spinners, spoons or flies can be very productive. Be sure to check the regulations for the closed areas. Chinnok and coho salmon are found here, as are burbot, lake trout, rainbow trout, whitefish and a host of coarse fish. 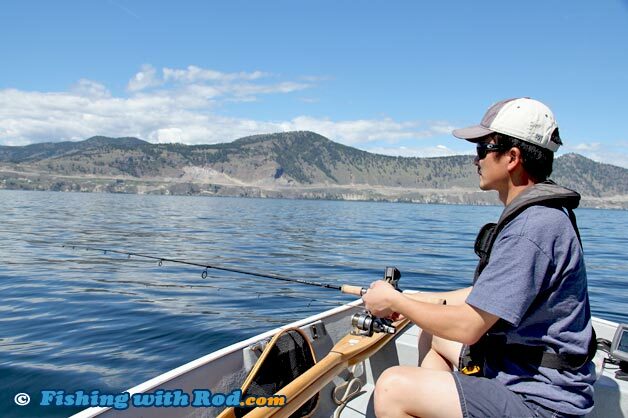 Those are just a few places to experience some great Okanagan fishing. Stop at any of the local fly or tackle shops for tips and directions and be sure to read the regulations before you go.